So unless I’m completely crazy, it looks like “The Hobbit” 75th edition is in Kindle Unlimited on Amazon, but also selling over on Apple. Am I just late to this realization, that non-indies can be in KU and not be exclusive? What am I missing here? 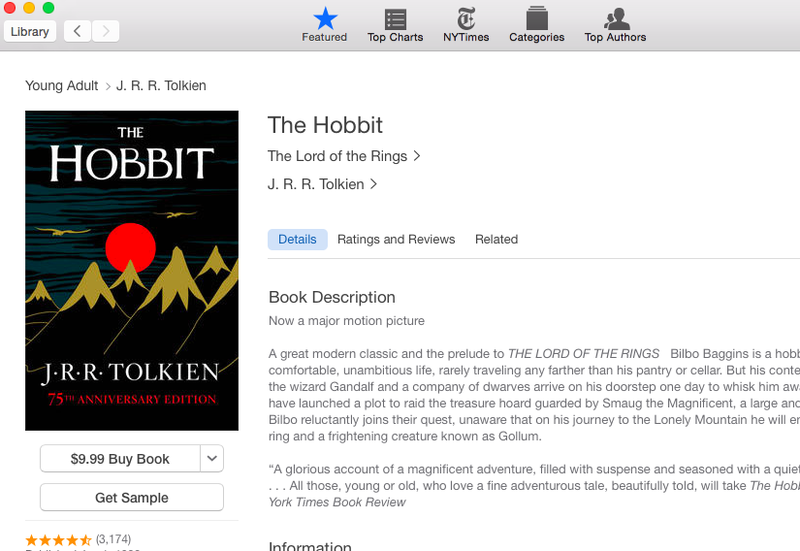 First picture is from Amazon, the second is a screenshot from Apple (just open up ibooks and search for “the hobbit” to see). Yeah, there’s a second set of rules for people like us. 😦 It’s been like that since the beginning if I’m not mistaken. Yeah… On one hand it’s nice to know that my work is out there and people are reading and enjoying it. On the other hand it would be nice not to be treated like a second class citizen. Oh well, hopefully I’ve already made more money than if I kept sending out queries and getting back rejections. I think Amazon makes non-exclusive deals with best-sellers in music, books and video in order to attract them to Prime and Kindle Unlimited (Hunger Games, Shades of Gray, etc. It makes the deal look like all the best sellers are to be found there.